Want to start working out, but not sure how? Do you want to start eating healthy, but don't know what to eat and what not to eat? Perhaps you want some extra motivation to get started. Personal Training could be the solution. Learn how to best utilize your time in the gym by doing the most effective workouts and which group classes fit your needs. 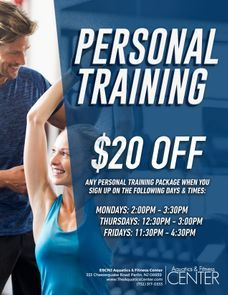 Each person has different goals and needs and each session is personalized and tailored to help you achieve your personal fitness goals.